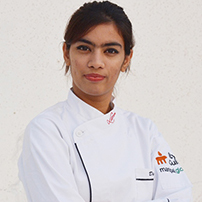 “The Cake Alchemist” is a business venture and a blog owned by Disha Naik. She is a 20 year old Pastry Chef. Her journey from being a normal girl to ‘The Cake Alchemist’ has been extraordinary. Unlike many, at a very early age in life she discovered her passion. She decided to follow her heart rather going through the conventional ways of the society. She took a bold decision of dropping out of college and determined to do something about her passion for baking. She started her business venture ‘The Cake Alchemist’ at an age of 18. While listening to her heart to pursue passion and love for Pastry Arts, she realized her true purpose of life. In her cake venture, she wants to support the ‘abled’ people by providing them earning opportunities and lead a self sustained life. Also, she believes that she bakes happiness to spread happiness. And with this motto, she wants to cater to ‘bottom of the pyramid’ to elite class and spread happiness.